Have you been thinking about doing something for your community? Are you interested in learning about law enforcement? Become an auxiliary police officer! What is the auxiliary police? Auxiliary police officers are 100% volunteer men and women who want to serve their community. Auxiliary police officers have full police powers when working, are considered peace officers and have the opportunity to do many different things. They can direct traffic, perform crowd control, respond to emergencies, such as flooding, perform regular patrol functions, ride along with regular police officers on patrol and many other things, once they complete the Auxiliary Police Academy. Training is done at Stamler Police Academy in Scotch Plains. The training runs for approximately three months and covers everything from traffic control to self defense, CPR, basic first aid, use of force and physical conditioning. It is also a great introduction for those thinking of law enforcement as a career. An applicant needs to be a United States Citizen, at least 18 years old, have a clean driving license and no prior arrest history. 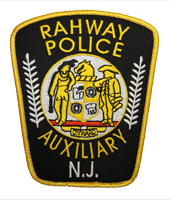 Also, you should reside in town, unless the town you live in does not have a police auxiliary program ( under 5 miles from the City of Rahway). An Auxiliary Police Officer is expected to work a minimum of eight hours per month. There are many opportunities to work more hours with various details. There is a rank structure as in the regular police department from corporal to chief. Promotions may be earned by those who work hard, participate, gain experience over time and exhibit leadership. There is fellowship, friendship, a chance to learn new skills, become a for multiplier for our police department and a way to give back to your community. If this sounds interesting to you-gives us a call! Remember this thought- Volunteers are unpaid, not because they are worthless, but because they are priceless.